A deciduous shrub of well-drained calcareous to moderately acidic soils. Habitats include woodland, scrub, hedgerows, cliffs, river banks, rock outcrops, roadsides, railways and waste ground. It can rapidly colonise open, disturbed sites. A fairly common wild rose, distinguished from the common dog rose by its very particular deep pink flowers, and also the smaller, greyer, softly downy leaves that give the plant its name. Downy roses seem to have a liking for lime, and are most often seen on the southern Tabular Hills on the Corallian limestones. 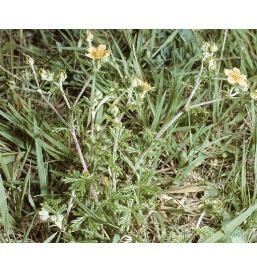 A perennial herb, mainly occurring in calcareous grassland on chalk and limestone downs, and in rough pasture; also found on coastal and inland heaths over limestone, chalk and other basic rocks, including serpentine. It is frequently planted in churchyards in W. Wales. Generally lowland, but reaching 365 m in N.E. Yorks. A deciduous shrub with weak flexuous stems which often climb over other vegetation, often forming dense patches. It grows on a wide variety of soils, but avoids very acidic sites, and is found on woodland edges, in clearings and along rides, on roadsides and railway embankments and in scrub and hedgerows. Gardens. This perennial herb is a relic of cultivation which occurs as a casual, semi-established or naturalised plant in grassy places, on field edges, tracksides, banks, roadsides and railways. An erect perennial herb found in hedgerows, woodland margins and roadside verges, generally on soils which are neither strongly calcareous nor strongly acidic. 0-335 m (Fortingall, Mid Perth). A medium-sized tree which is sometimes planted in parks and large gardens and occasionally naturalised in various habitats including woodland, scrub, rocky slopes and river banks. Generally lowland, but reaching 450 m at Carreg Cennen (Carms.). A perennial stoloniferous herb, widely naturalised on railway banks and in waste places, and a casual on rubbish tips. 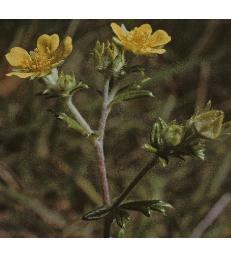 It usually grows as a naturalised plant on deeper soils than F. vesca. This is the most common variety of strawberry cultivated worldwide. A perennial herb of neutral grassland, occurring on alluvial or peaty soils in damp or dry, unimproved pastures, hay meadows and marshy meadows, on river banks and lake shores and in base-enriched flushes on grassy heaths. 0-460 m near Cauldron Snout, Teesdale (Westmorland). A spreading apomictic deciduous shrub confined to limestone rocks and ledges on the Great Ormes Head near Llandudno. 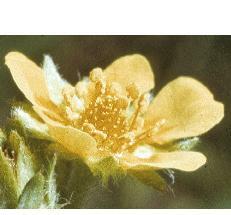 The few plants which remain from a larger population do not appear to regenerate either by seed or vegetatively. A deciduous shrub or tree of hedgerows, scrub and wood-borders, and as an understorey in open woodland on a wide range of soils. It can persist as scattered bushes in grazed sites, spreading rapidly when grazing declines or ceases. Its prolifically produced fruits are an important winter food for birds. 0-610 m (Melmerby High Scar, Cumberland). A perennial herb of freely-draining, mildly acidic to calcareous soils. It is found in moderate shade in deciduous woodland (especially in disturbed sites in secondary woodland), scrub and hedgerows and in more disturbed and open habitats, where it may grow as a street or garden weed. Generally lowland, but reaching 450 m on Alston Moor (Cumberland). 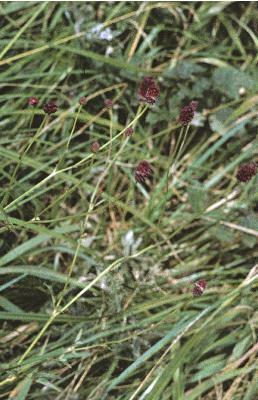 A perennial herb of dry, freely-draining, gravelly or sandy soils, found in open grassy swards on commons, in pastures, on banks, in pits and on tracks and waste ground. Reproduction is by seed, but it does not readily colonise new sites. Lowland. 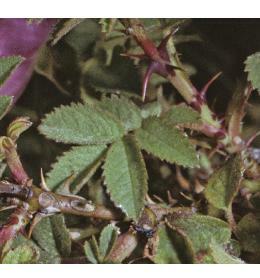 This vigorously suckering, deciduous shrub has many slender thorns on its stems and with its characteristic purplish-pink flowers is readily distinguishable from other roses found in the wild. 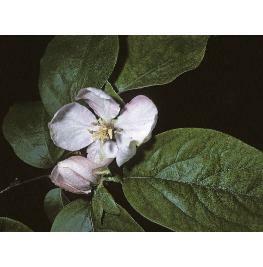 A shrub or small tree mostly growing on acidic, usually sandy soils and naturalised in open woodland (often Quercus or Betula), wood borders and scrub, and on dry heaths and roadsides. An erect, deciduous shrub, found in woodland, hedgerows, rocky grassland and scrub and on heathland, rock outcrops, walls, pavements, quarries and waste ground. It is frequently naturalised, and often originates from bird-sown seed. Generally lowland, but reaching 335 m near Watermillock (Cumberland). 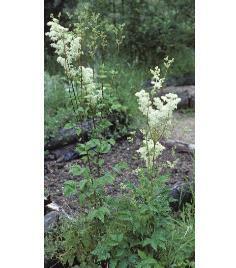 This montane perennial herb has two main habitats. 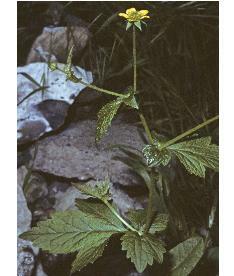 It is most abundant in areas of late snow-lie, in corries and hollows and especially under cornices along a ridge. Its other main habitat is on bare, stony surfaces of high plateaux, often in areas of severe wind-scour where permanent snow does not lie. From 425 m (Sgurr na Coinnich, Skye, N. Ebudes) to 1310 m (Ben Nevis, Westerness). A rhizomatous perennial herb found in permanently flooded swamps, and in mires and wet meadows where the summer water table lies below the soil surface. 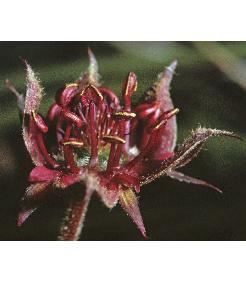 It prefers nutrient-poor but slightly to moderately base-rich water and grows on a wide range of soils. Habitats include the edges of lakes, natural hollows, bog pools, peat cuttings and floating rafts of vegetation. 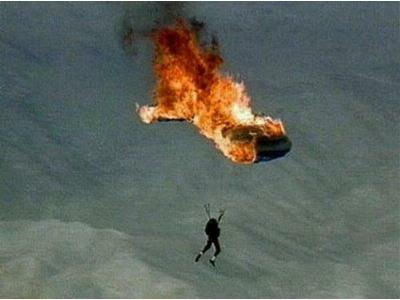 0-800 m (Tom a`Choinnich, E. Ross). 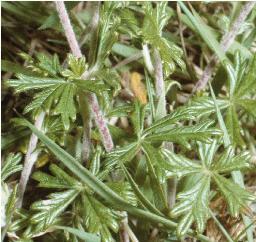 A perennial herb of damp or wet habitats, on moderately fertile, neutral or calcareous substrates; it is characteristic of sites where water levels fluctuate and is absent from permanently waterlogged ground. Typical habitats include wet woodland, damp meadows, swamps and tall-herb fens, damp roadsides, ditches and railway banks, and montane tall-herb communities. 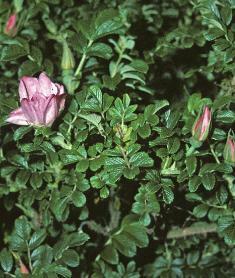 It also occasionally grows in somewhat drier conditions, such as N.-facing chalk grassland. It is intolerant of grazing and rarely flowers in shade. 0-880 m (Breadalbanes, Mid Perth). A long-lived shrub or small tree occasionally found in hedges or woods, and as a relic of cultivation. In Britain, regeneration from seed appears to be very rare, but vegetative spread by suckering has been recorded. Typically resulting from garden escapes or material thrown out from gardens. 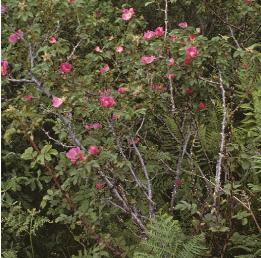 The Japanese Rose is often well-naturalised, forming extensive and dense thickets, which can smother native species, so reducing biodiversity and dominating amenity planting. 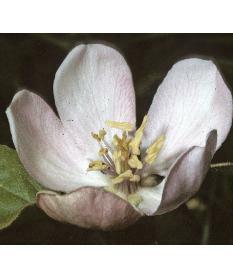 Although introduced into cultivation in the UK in the late 18th century, it was not successfully grown until the mid-19th century. 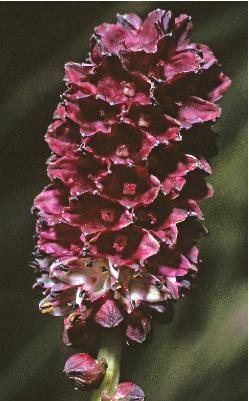 It is very common in gardens, parks and amenity plantings, often established in mass plantings. It was first recorded in the wild in Cumberland in 1927. Its distribution in the wild is increasing. 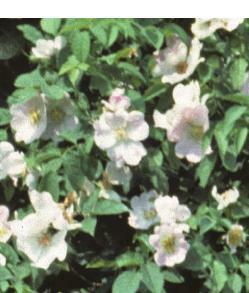 Japanese rose is listed under Schedule 9 to the Wildlife and Country-side Act 1981 with respect to England and Wales. As such, it is an offence to plant or otherwise allow this species to grow in the wild. It is also an offence to possess it in the UK. For details of legislation go to Department for Environment Food and Rural Affairs.